It goes without saying that floors are made from different materials and all of them require different cleaning tools. Vinyl is also a popular surface used for floors, so you need to get the best mop for vinyl floors to make them look shiny and clean. Why is it difficult to clean vinyl floors? In fact, this type of surface makes dust and dirt clearly visible so you need to remove it fully to prevent the appearance of latches. In other words, if you choose the wrong mop, you will have to clean it multiple times in the clean water to achieve a perfect effect and it is a painstaking and time-consuming process that kills all the desire to clean. That is why the choice of a suitable mop for vinyl floors can ease the cleaning process and decrease the time spent on it. We have analyzed the market of modern cleaning tools and find out TOP most effective mops for floors mentioned below. Choose the better mop among them and your vinyl floor will illuminate free of dust. How to save vinyl floors? Basic rules for cleaning vinyl flooring? 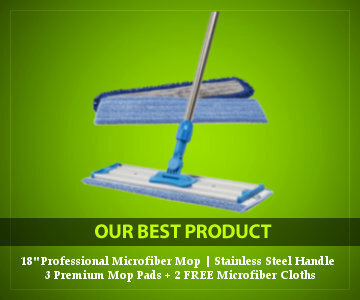 Many people wonder how to clean vinyl floors, but Microfiber Wholesale company has already found a solution to this problem and created a great quality professional mop. Meant for both home and office use this professional mop is highly durable and quality. It works great on both laminate and hardwood, vinyl and tile, concrete and stone floors and does not require any effort to guarantee excellent results. 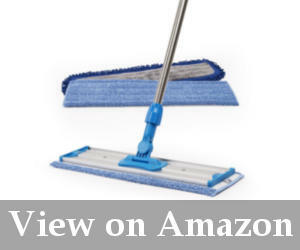 The mop frame is 18 inches long and made of heavy-duty aluminum that makes it long-lasting and lightweight. There is an adjustable stainless steel handle. It can extend from 4 feet to 6 feet with a single movement of your hand and you can determine a perfect handle length in accordance with your height. The handle is attached to the aluminum frame with a 360° swivel that makes even hard-to-reach places of your home accessible. There is also a comfortable plastic handle for a mop not to slip from your hands and a hole on the top to hang it for more ergonomic storage. The aluminum frame is covered with microfiber pads used for different purposes. When you buy a mop, you also get one microfiber dust mop pad and 2 microfiber wet mop pads to clean the floors both wet and dry. Dust mops are used to clean large debris, while wet pads guarantee a deeper clean. In addition, you get 2 free premium microfiber cloths as a gift. You do not need any buckets or chemicals to clean the floor as a microfiber pad attached to the mop is removable. It is enough to take it off and wash under the tap water yo continue cleaning. Moreover, the pads are also safe for machine wash so you can always mop your floors with absolutely clean pads. Clean your floors effectively with this lightweight mop as its weight does not exceed 3.25 pounds. You need to take a dirty pad with your hands to take it off. You do not need to look for the ways how to make vinyl floors shine as with this mop it is not difficult. It is enough to put the pad on this wide mop and you can either sweep or wash the floors without putting any effort. It can access hard-to-reach areas and remove embedded dirt if you need. It is not difficult to find the answer to the question “how to deep clean vinyl floors?” as a Swiffer mop offers both wet and dry cleaning. When you buy this mop you get a starter kit with seven disposable unscented dry sweeping cloths and three wet mopping cloths. The first ones are thick enough to guarantee a 3x action: clean dirt, dust, allergens, and hair. Wet clothes are designed for dissolving dirt and grime, trap it inside and lock it away. The size of dry cloths is 10.4 × 8 inches, while wet cloths measure 10 × 8 inches. To start using the mop you need to connect poles. The handle is attached to the frame with a swivel that helps to access hard-to-reach areas. 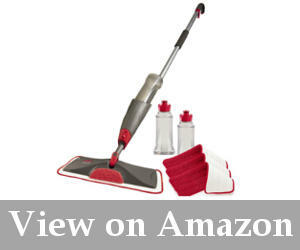 It is very easy to attach to and remove cloths from the mop to get great cleaning results. The mop is great on the floors of the following types: tile, laminate, hardwood, and vinyl. It weighs only 1.5 pounds and is 12.4 inches long. Too lightweight to press down hard on the floor. There is no need to think how to clean vinyl floors with vinegar as with this mop it is enough to take the cloth, wet in the water and vinegar mix and attach to the mop. As a result, you get a shining and absolutely clean floor free of dirt, dust, and allergens. With this mop, you also get a great kit for beginners to make all the floors in your home clean. It is senseless to search the good sponge mop for vinyl floors as it is much more reasonable to get a microfiber mop with a scrubbing pad to remove tough stains. This Rubbermaid mop will attract you with a number of unique features it has. The mop is safe to use on all types of floors. You can clean any surface including vinyl floors with its help. What makes this mop so great? First of all, it is a metal handle with a soft grip for more comfortable holding. Secondly, it is a spray system that allows wetting the floor and clean it immediately. There is a spray trigger for dispensing water or a solution to clean the vinyl floors. Together with the mop, you get 22 oz refillable bottle to mix the cleaning solution. You need to fill the bottle with hot water and add to teaspoons of the detergent to get excellent cleaning solutions. Thirdly, there are 3 microfiber pads included in the kit. They gather up to twice more dirt and dust than ordinary mops. These pads are reusable and can be washed in the washing machine up to 100 times. The other great features of this mop are a swivel head that allows washing even hard-to-reach areas and a non-scratch scrubbing pad. The last one is located on the top of the head and you need to turn it around to use it on the floors. The mop to wash different floors is rather lightweight – only 3.79 pounds and can be used even by tall people as its length is 57.3 inches. There is a hook at the edge for ergonomic storage. There is hardly any better mop for fast cleanups. 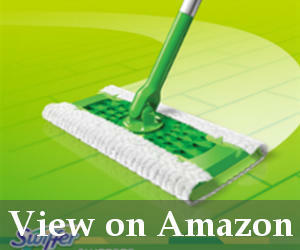 This spray mop not only washes the floors effectively but also is reusable so its washing potential is great. You will love how effectively it works on vinyl floors and what a versatile floor cleaning it offers. It has always been a problem how to clean shaw vinyl plank flooring, but with this Linkyo floor mop, it will become only a pleasure. Its great benefit is a premium quality. You will use it for years thanks to the steel handle, lightweight and long-lasting aluminum frame and reliable ABS plastic. There are also other great features of this mop to wash vinyl floors. This model for vinyl floors is sold in two connectable pieces that make up a handle. This adjustable handle that can be extended up to 70 inches thanks to the additional piece included. The handle is attached to the frame in the way that it can swivel up to 360°. It makes it very maneuverable and effective. The frame is 14.75 inches wide and has an easy clip design to keep pads securely. Moreover, there are scrub lines on the edges to remove embedded dirt. 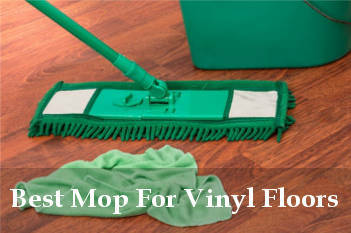 The mop for vinyl floors is sold with two reversible microfiber mop cloths and one standard microfiber mop pad. All of them are reusable and can be washed in the washing machine multiple times. In addition, they offer a dry and wet cleaning depending on the pad you use. Despite the fact that these pads are rather durable, if they once get worn out, you can buy an additional set of floor pads to use with this mop. 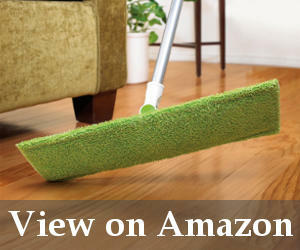 You will be impressed how brilliant your vinyl floors will look like after you clean them with this lightweight mop. With the weight of 2.4 pounds, it makes the process of mopping floors a real pleasure. The handle keeps coming undone of not screwed tightly. Vinyl floors gather dust very often so sometimes you do not wish to mop floors with a wet cloth to remove it. That is the reason to obtain this great mop to clean vinyl surfaces as it offers not dry and wet cleaning. Is greatest benefits are the simplicity of use, long handle suitable even for tall people and great clips on the frame that hold not only pads but also towels securely. Vinyl is a material that requires regular wet cleaning, so a good mop is a necessity in every home. If your floors are covered with vinyl, choose this Scotch-Brite mop to make your home shiny. The mop has a long 59-inch handle. It is made from aluminum and has a plastic cap with a hole on the edge to hang it for more comfortable storage. In other cases, it stands upright if leaned against the wall. The mop head is attached to the handle in the way that it can move, so this swivel design makes the tool maneuverable and reaching distant areas. 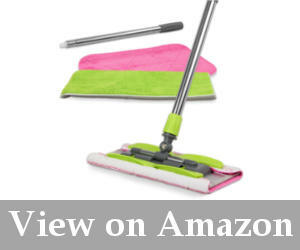 The mop head is covered with a microfiber cloth that traps dirt and dust effectively. You can spray some cleaning solution on it to clean floors effectively. As the mop head can be detached, you can wash it easily after the process. There is a button on the mop head too. When you press it, the head folds in half and you can easily remove the pad to wash it. The last one is safe for washing machines. The mop to wash floors is very lightweight – only 1.05 pound. Does not get shorter or folded. If you do not need anything extraordinary like the super steam mop for vinyl floors or one with a spray system, there is hardly any better variant to clean vinyl floors than this mop. One of the top-rated models, it guarantees efficient cleaning and is so lightweight that you do not feel it in your hands. A great mop to keep your floors in order. If you are a fan of vinyl floors and you adore their perfect look in your home, it is important to learn how to clean them right and effectively for them to serve you for many years. Vinyl floors can be of different types, so it is very important to remember what type you have chosen to get a best right detergent. If it is no-wax vinyl, it is natural that wax solutions are forbidden. However, there are several more things to remember what you should or shouldn’t do with on your vinyl floors. People never see how many dirt and chemicals they bring home on their boots. These chemicals are very dangerous for vinyl floors, so you should remember to wipe your boots be for you step on the bare floor. Every heavy piece of furniture or appliance that takes its place for a long time can lead to dents on the vinyl floors. To prevent this unpleasant effect obtain protective ‘feet’ for these items and your floors will always have an excellent look. There is hardly any better tool for cleaning vinyl floors than mops with microfiber pads. The last ones can be used both for dry and wet cleaning, are often washable and guarantee a great result, so you will appreciate how effective these mops are on this floor type. Many people wonder ‘can you use a steam mop on vinyl plank flooring?’. Of course, it is not forbidden, but very intensive steam can damage the surface all the same. If you want to steam your floor covered with vinyl, use the half power, avoid direct contact attaching a microfiber cloth and move quickly not to steam at the same place for a long time. Vinyl will always look great if you do not allow dirt to ground in it. Regular quick cleans are a necessity for making floors look excellent. Vinyl requires mild cleaning. Use a broom or a mop, wipe the stains with a damp cloth, avoid powerful detergents – even customary soap can not often be used with vinyl. Why should you prefer microfiber mops to wash vinyl? You can squeeze almost all the moisture out of it and it will effectively gather it from the floor. It is a necessity as when water gets into vinyl seams, cracks or edges, it will probably destroy the glue to hold the material and it will wear out quickly. Vinyl is a type of floor that requires care. That means that it should be cleaned regularly and according to the certain rules. Consequently, if you want to prolong the life of your floors, it is a necessity to buy the quality mop for vinyl floors. And performs regular cleanups without putting much effort. The models offered above are ones of the better existing in the modern market. They have confirmed their durability and efficiency in many homes. So it is time to get a great vinyl floor assistant to your home as well. I am not much of a fan of these style mops but since I pulled my back, I am not able to use anything that takes a lot of force. My doctor recommended picking up that Swiffer Sweeper but I think the Rubbermaid one is more for me. They pretty much do the same thing but this one seems to have better feedback from what I am seeing. Thanks for the information. The Scotch mop is fantastic! I checked this list a few weeks ago and decided to order it on Amazon and I was blown away the first time I used it. It works great on all my floors too which is perfect! I don’t get those messy puddles either and my floors dry faster than the traditional mops and automatic cleaners/steamers. I am trying to find the best model for my sister in law. She and my brother just bought their first home so me and my other brother are putting together a fun house warming basket for her (my brother hardly does the cleaning lol). Do these all have washable and replaceable pads? I wanted to pick up 4 or 5 push mops for the vinyl flooring at my clinic (I am a veterinarian). Something simple that will handle light clean up between the floor company coming in once a week to professionally clean the place. What would give me the most value for my money comparing the top two on your list? I was using the Swiffer Sweeper for a few weeks in my kitchen. It is great for small messes but I would not recommend it for cleaning anything beyond that. It just doesn’t clean up as good as you would expect it to. I have a few small kids and pets so it does have its uses for me but again, for small clean up. I prefer the old fashioned mops to get a real good clean.